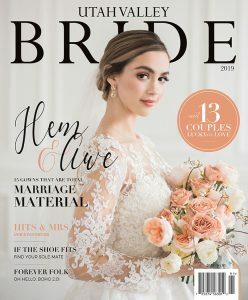 It’s Magazine Monday, friends! 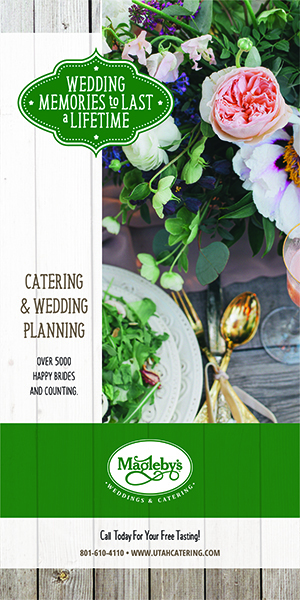 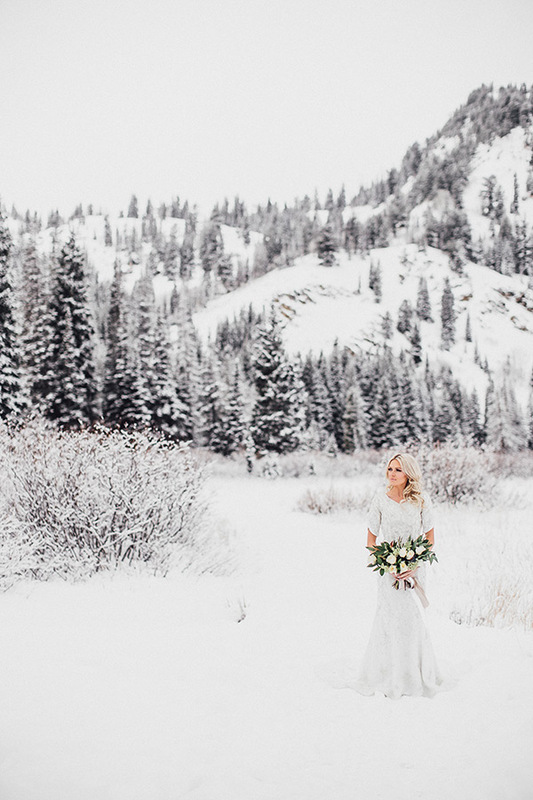 Enjoy a closer look at this gorgeous winter wedding from our 2017 glossy pages! 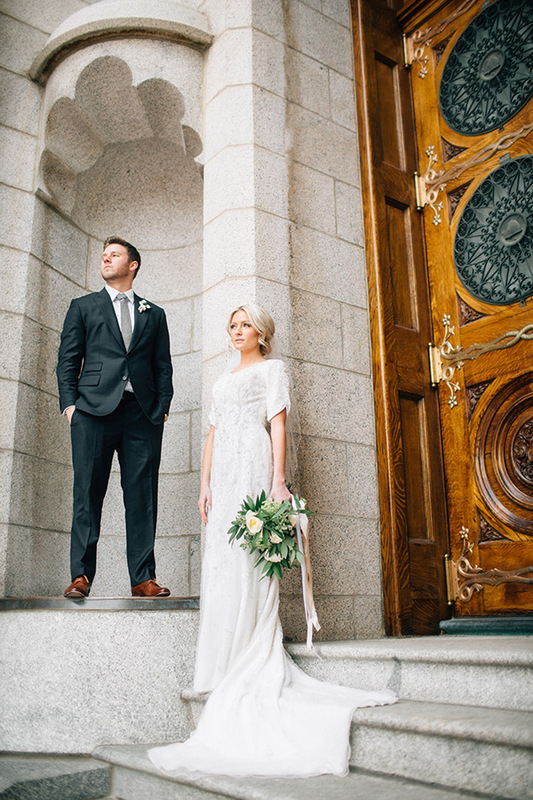 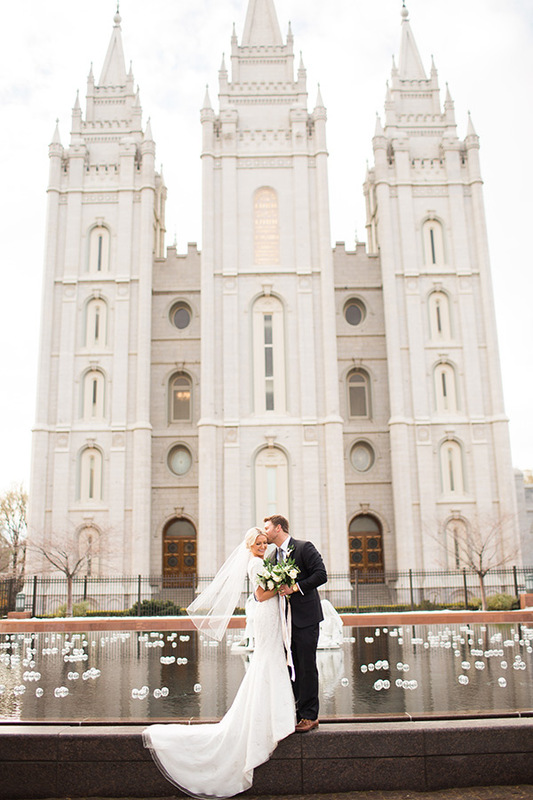 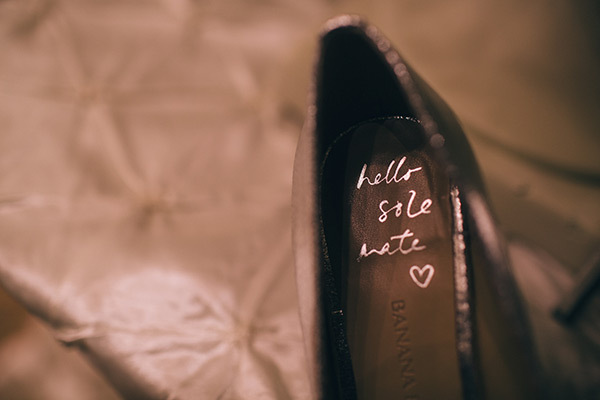 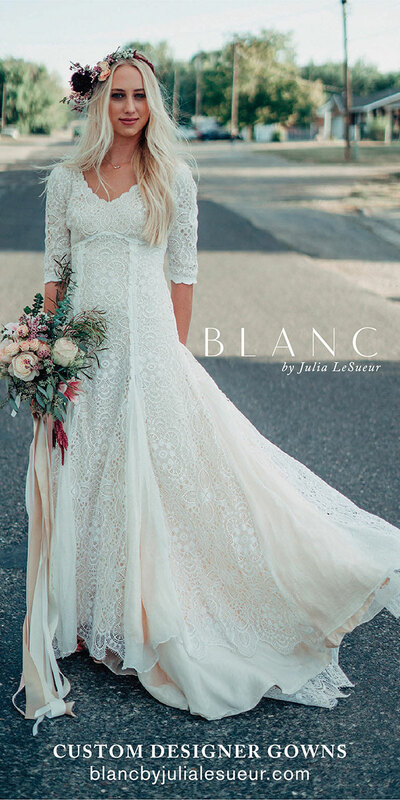 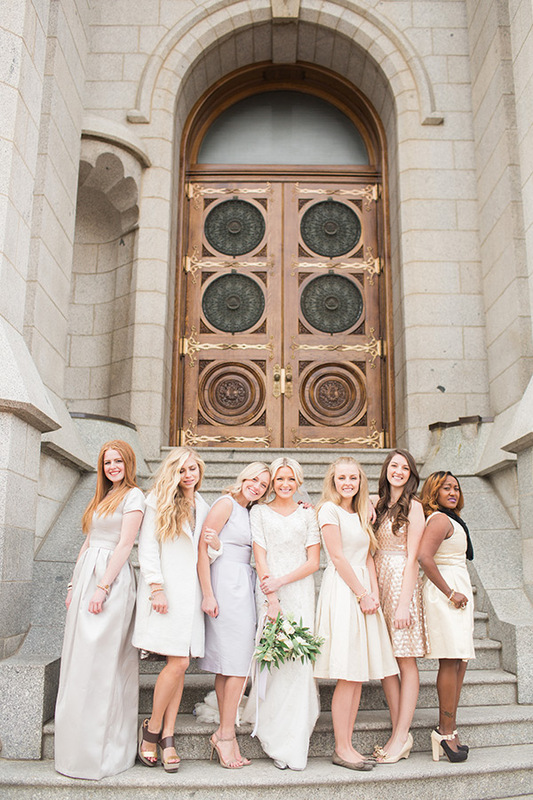 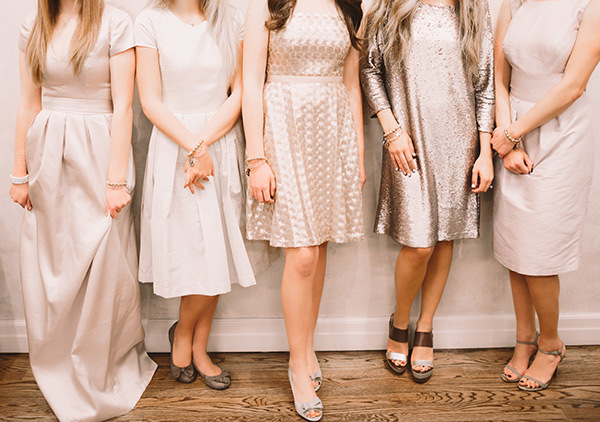 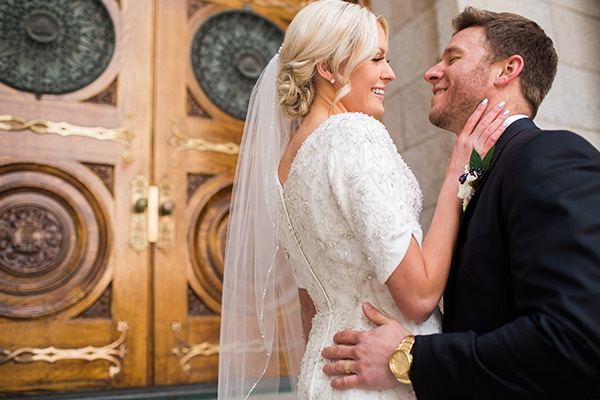 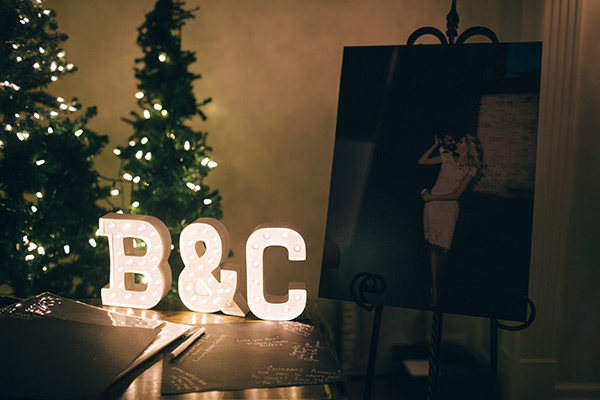 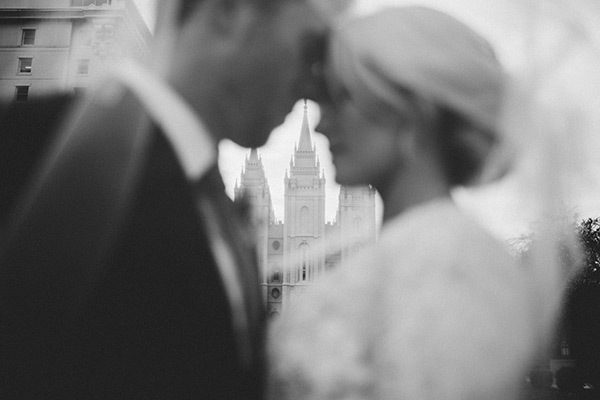 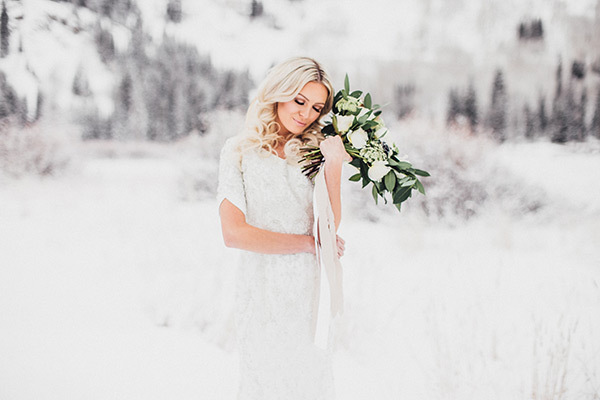 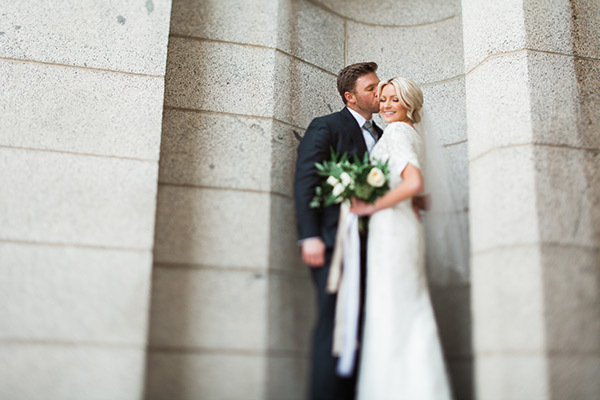 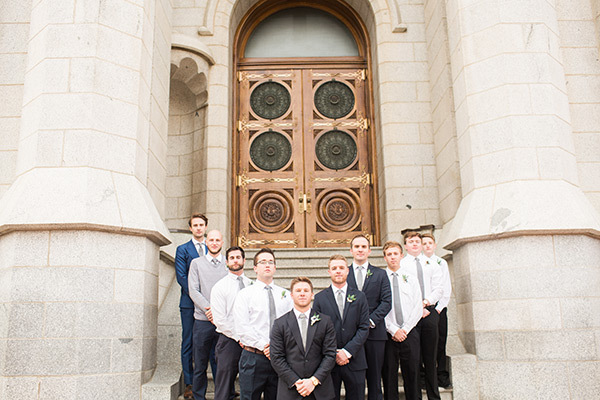 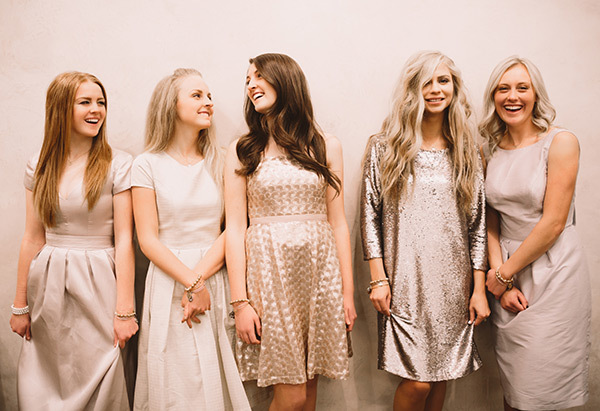 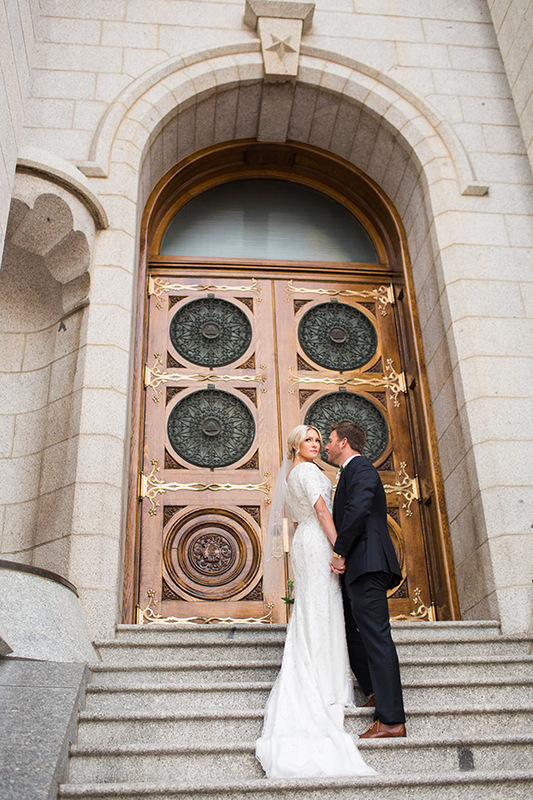 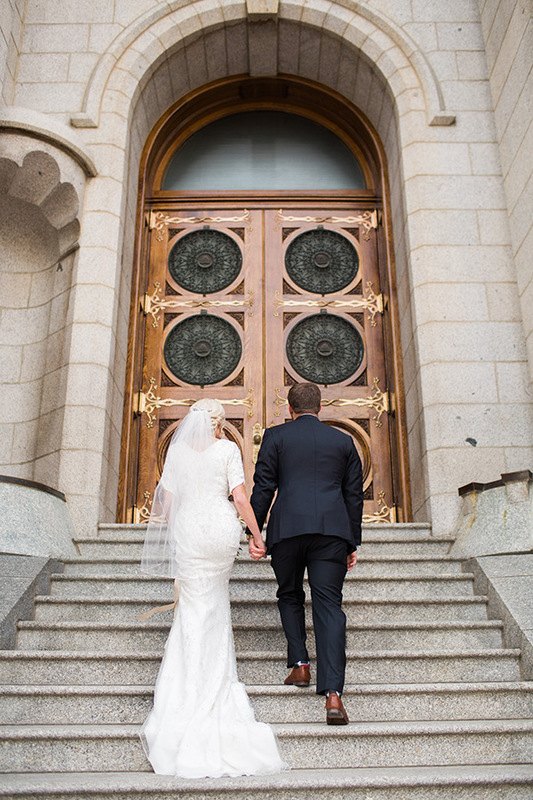 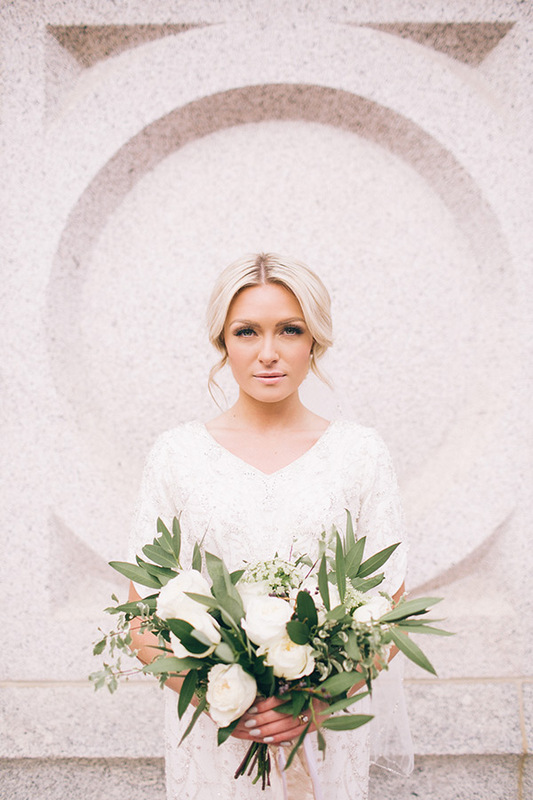 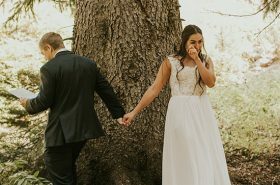 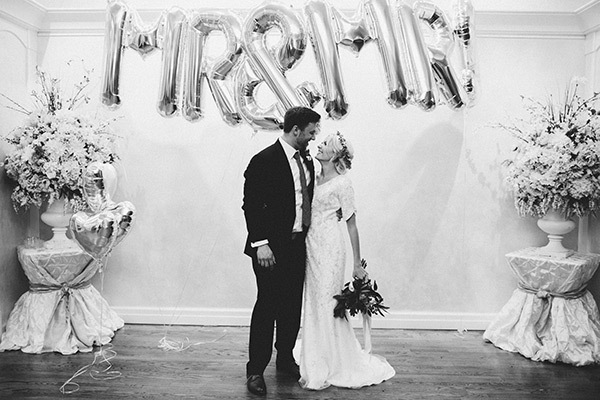 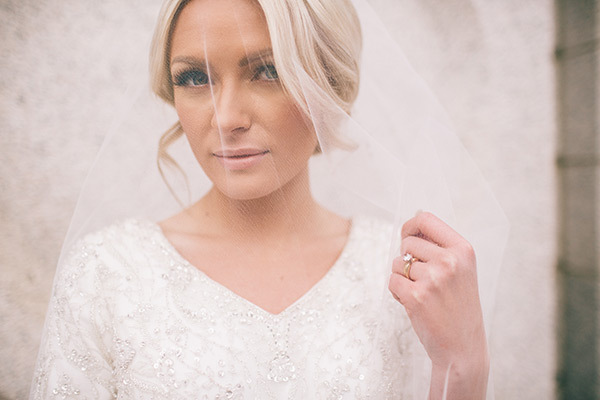 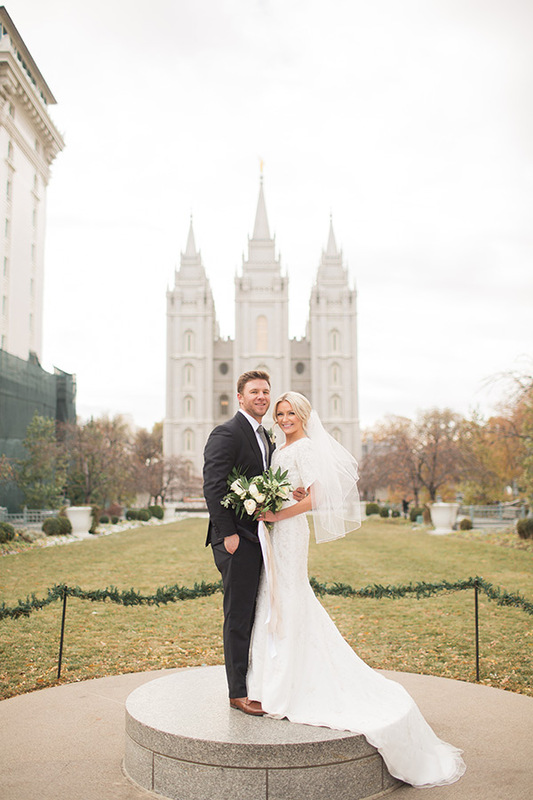 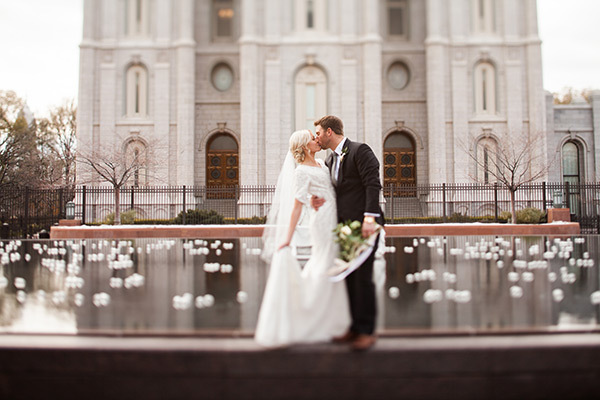 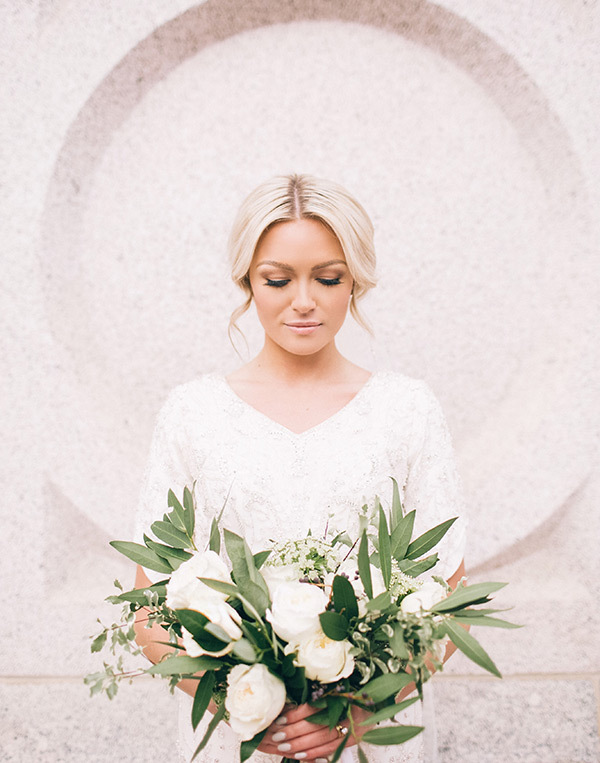 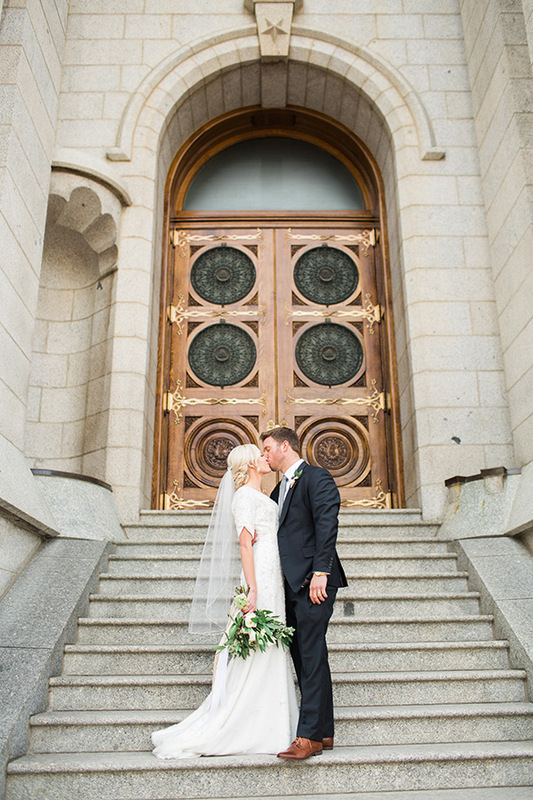 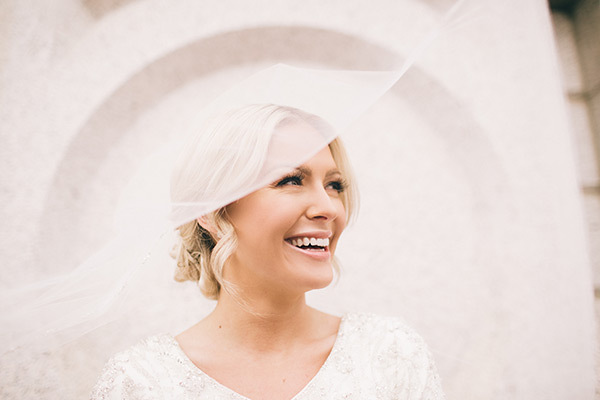 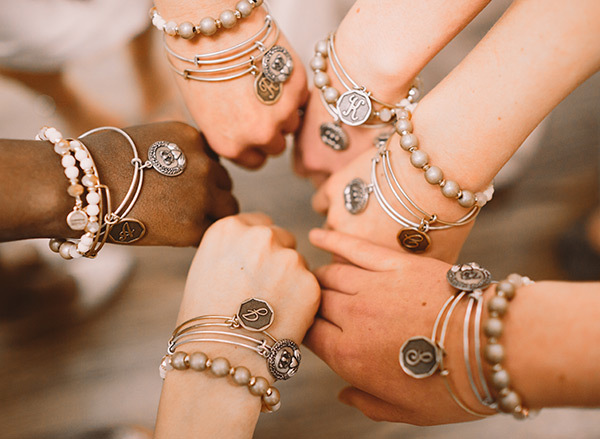 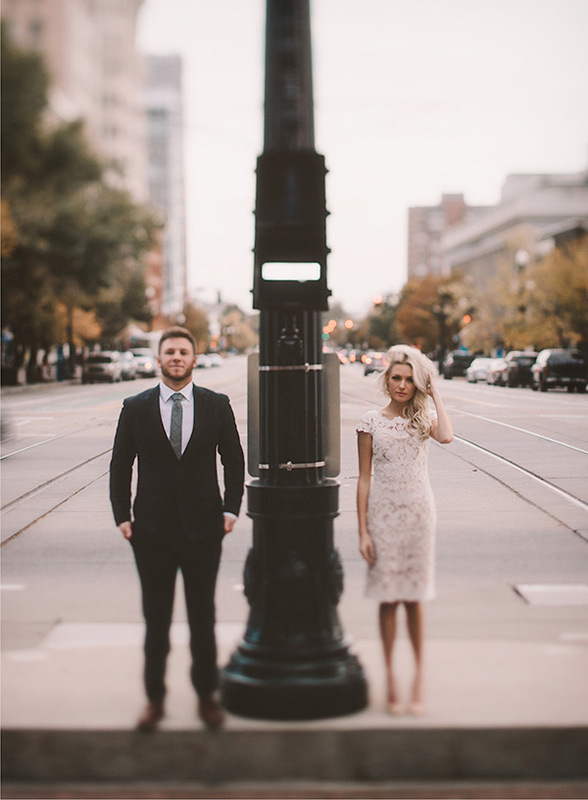 Brit, who is from Spanish Fork, is a fashion and lifestyle blogger, so she had a good idea of what vendors she wanted to help her bring her wedding day dreams to life. 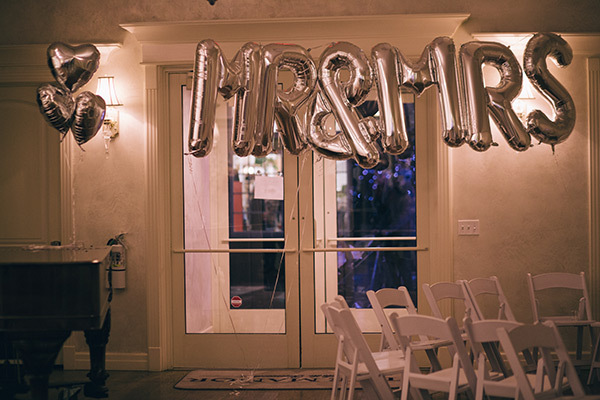 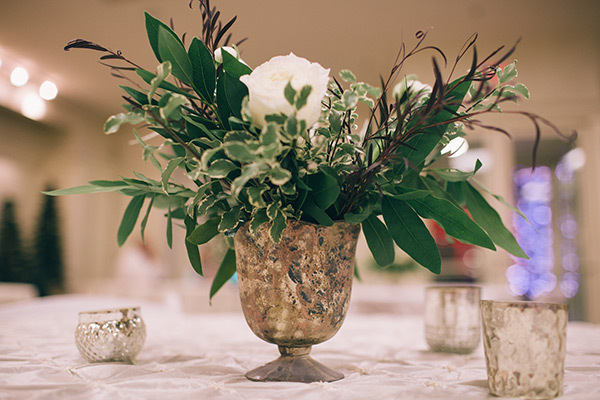 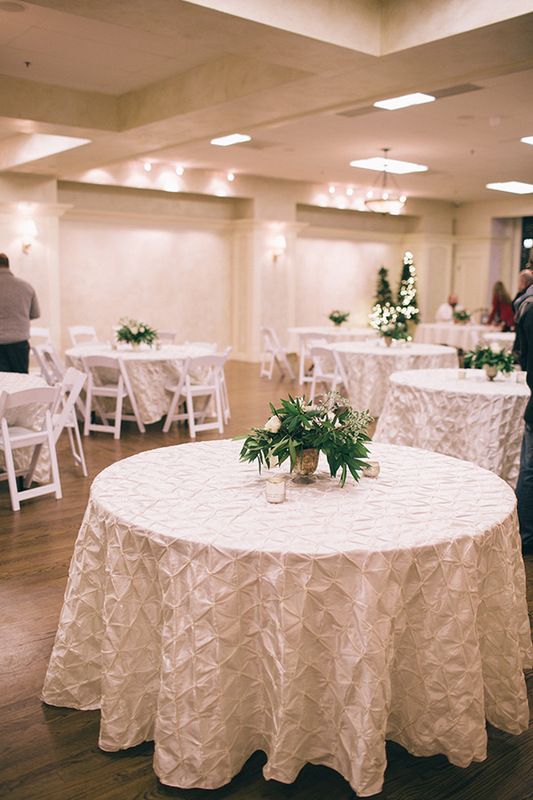 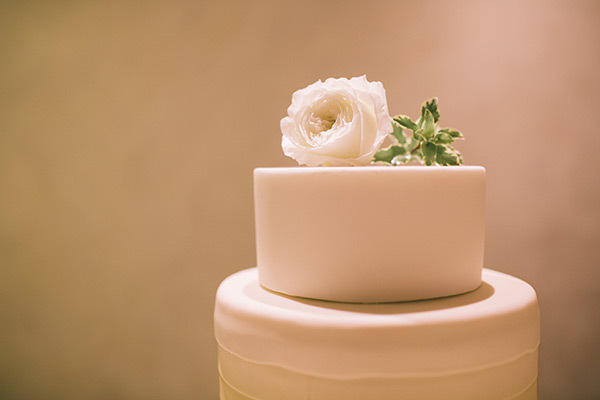 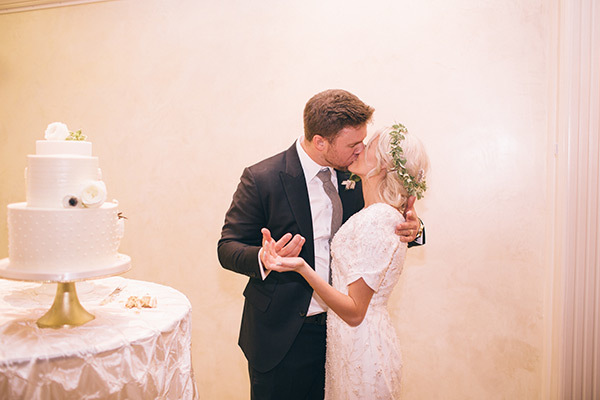 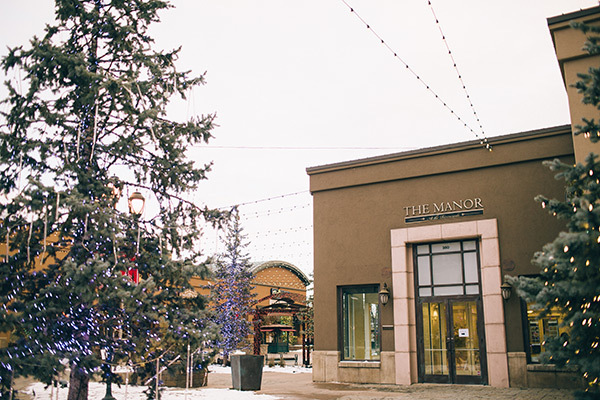 For the ring ceremony, dinner and reception, Brit chose The Manor at Riverwoods — a sentimental spot since the couple’s first date was across the street at La Jolla Groves. 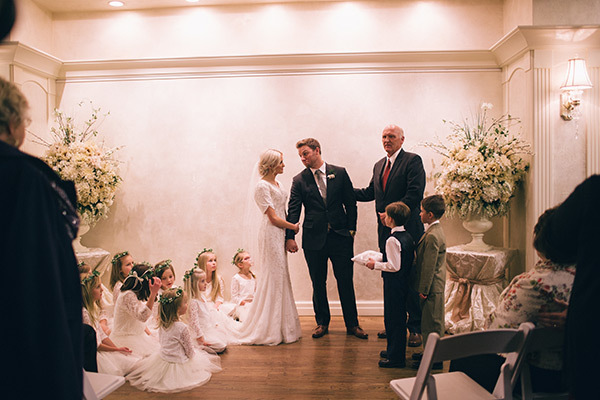 One of Brit’s favorite moments of the day was walking down the aisle with her dad and 10 flower girls. 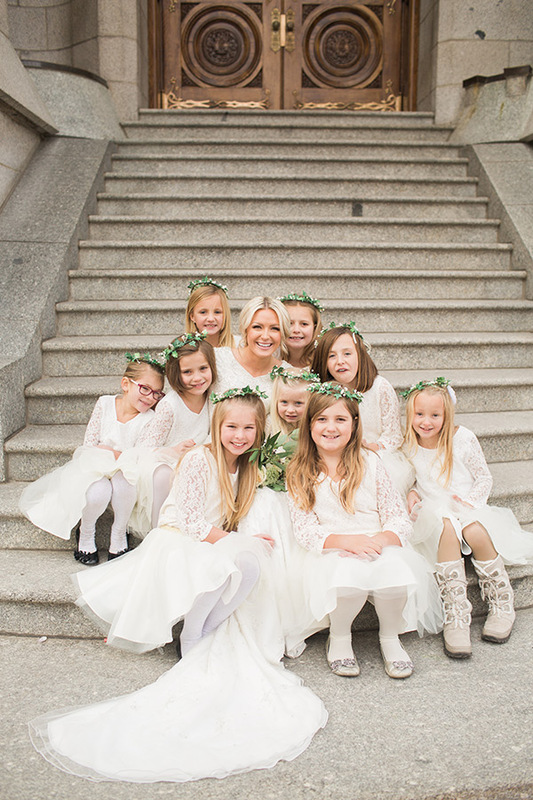 “All the girls were holding up my train and pulling it as tight as they could,” she says. 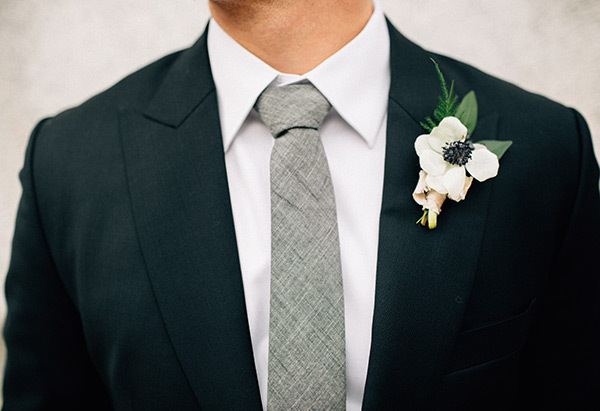 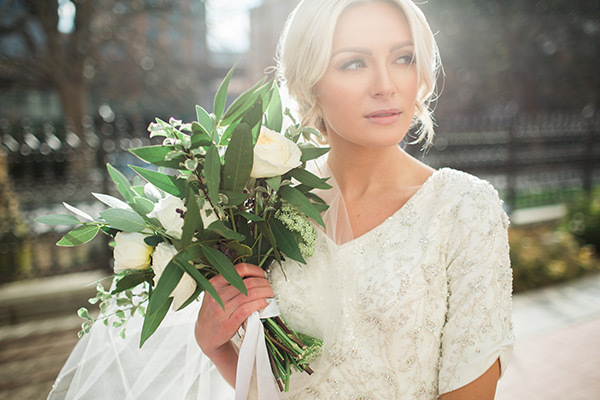 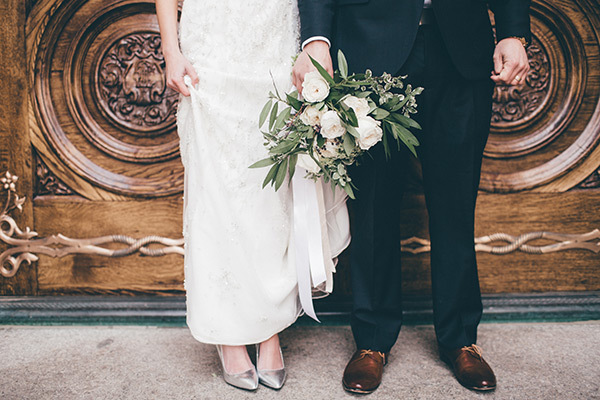 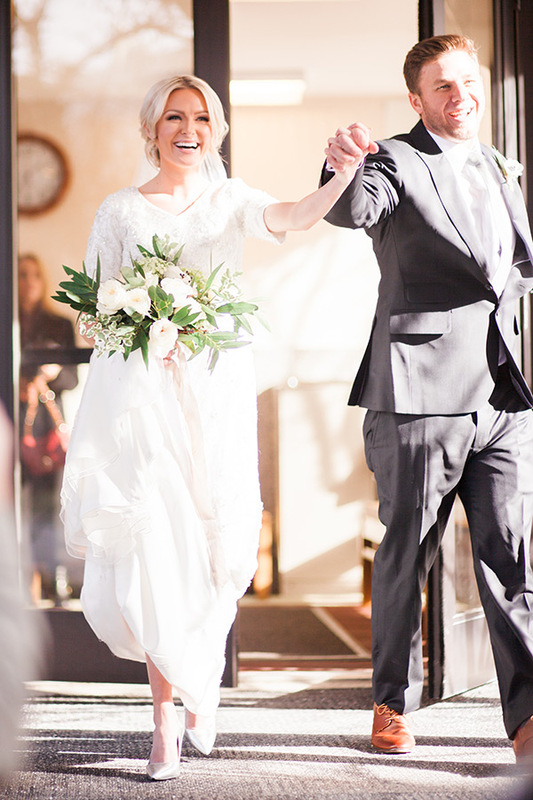 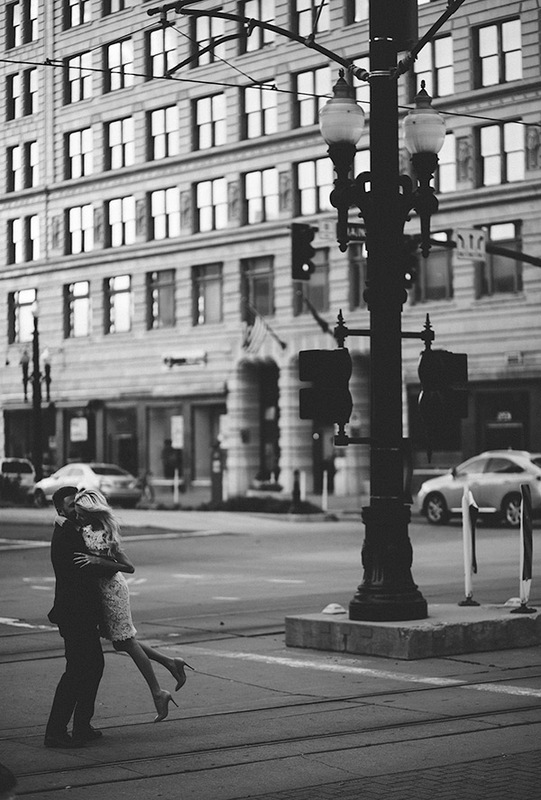 “My dress was riding up and I could hardly walk. 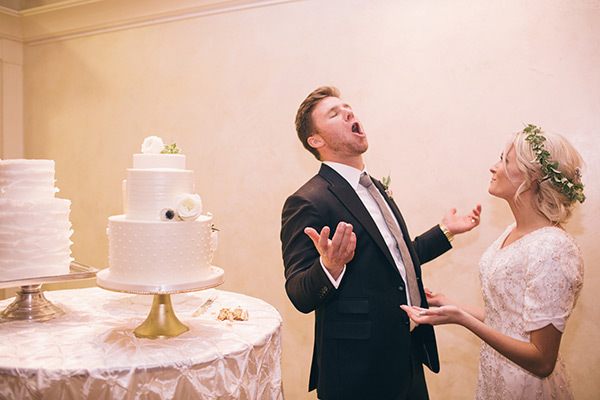 Every single guest was laughing. 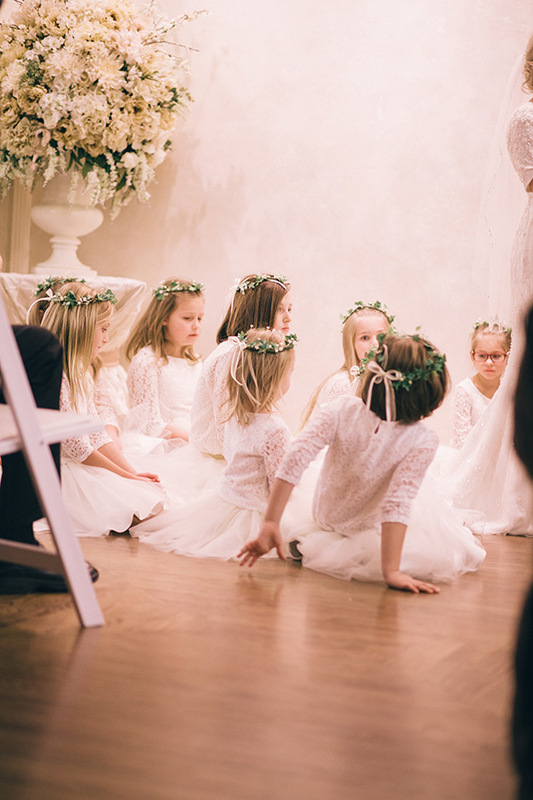 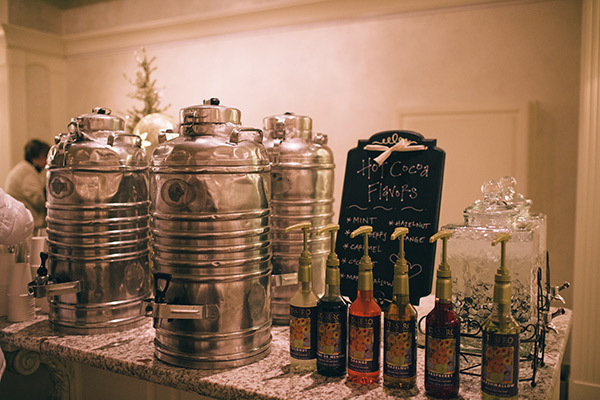 It was so cute and hilarious!” The flower girls were showstoppers at the reception, too. 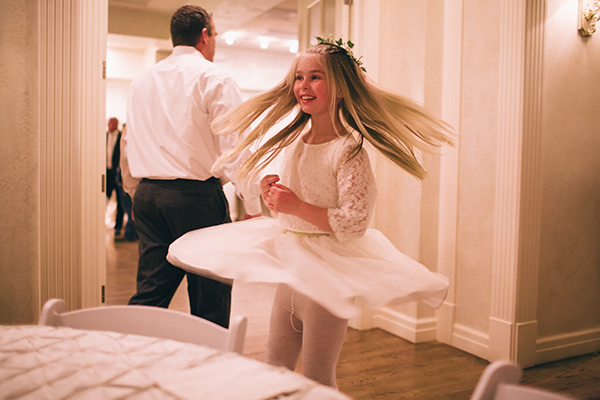 “All evening long we saw these little puffs of tulle bouncing around and it made everyone smile,” Brit says. 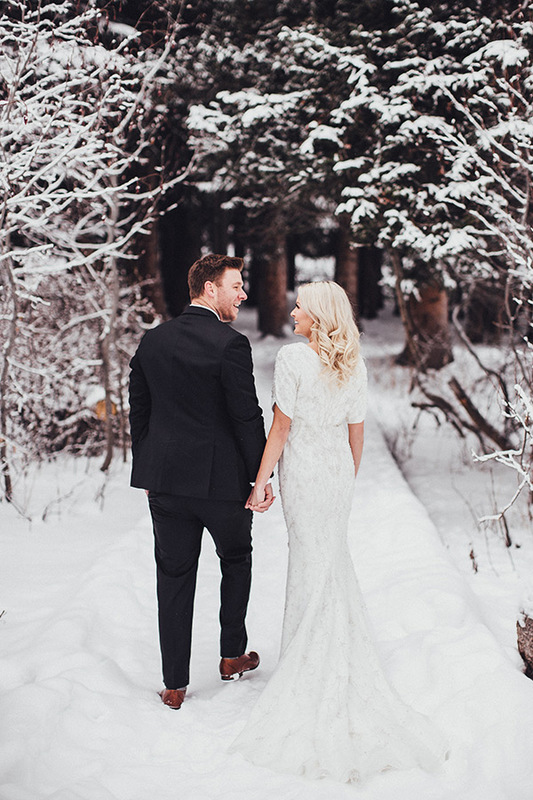 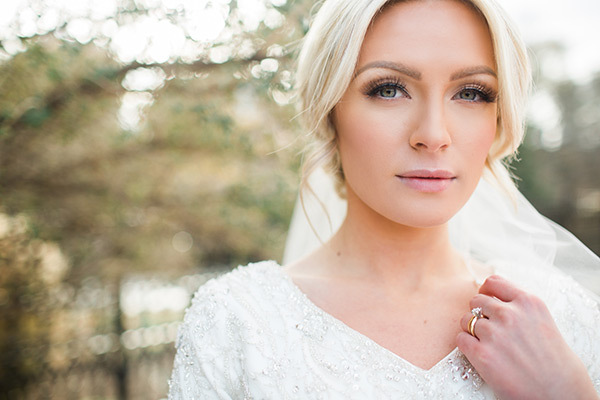 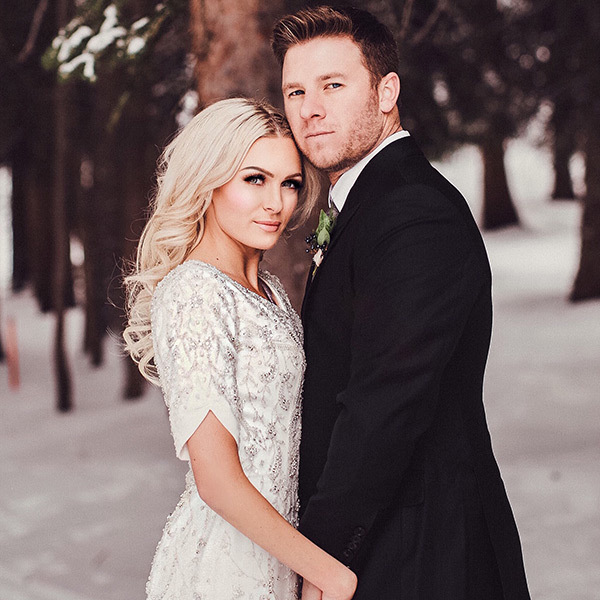 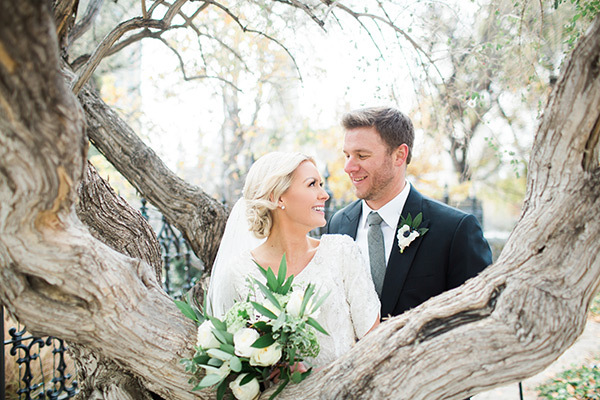 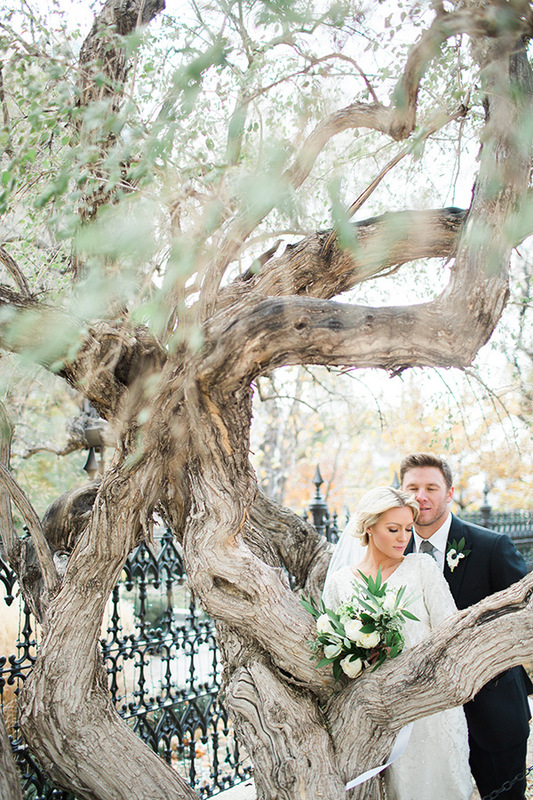 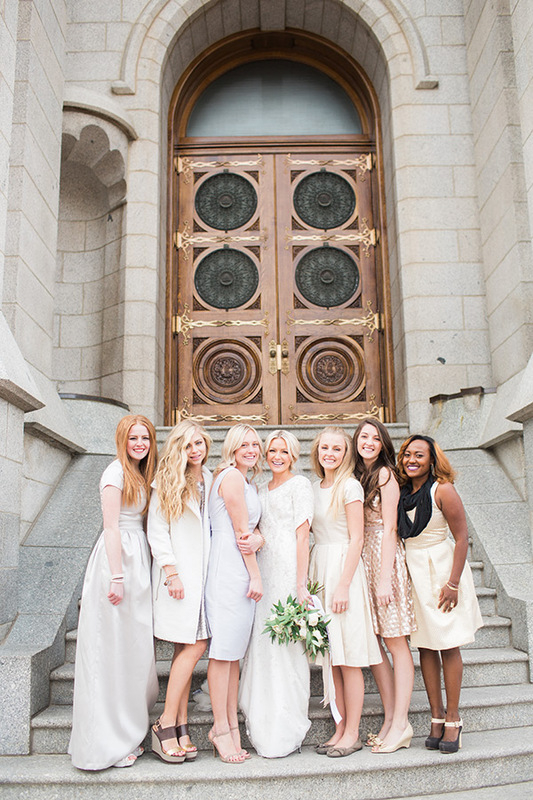 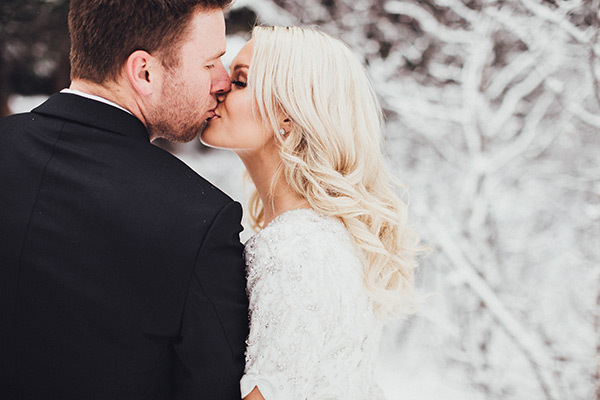 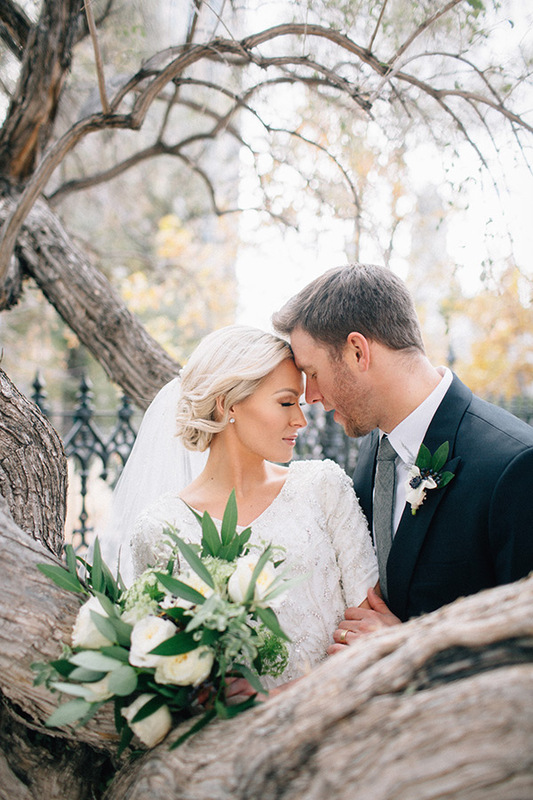 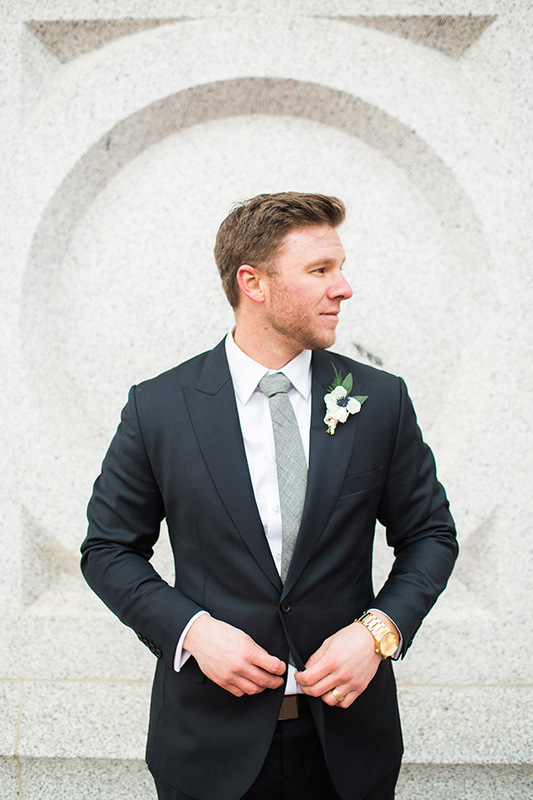 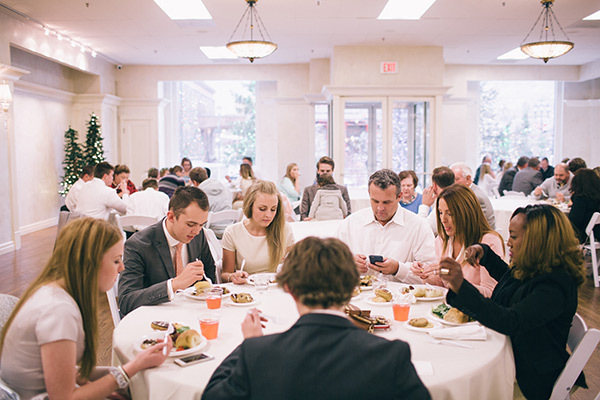 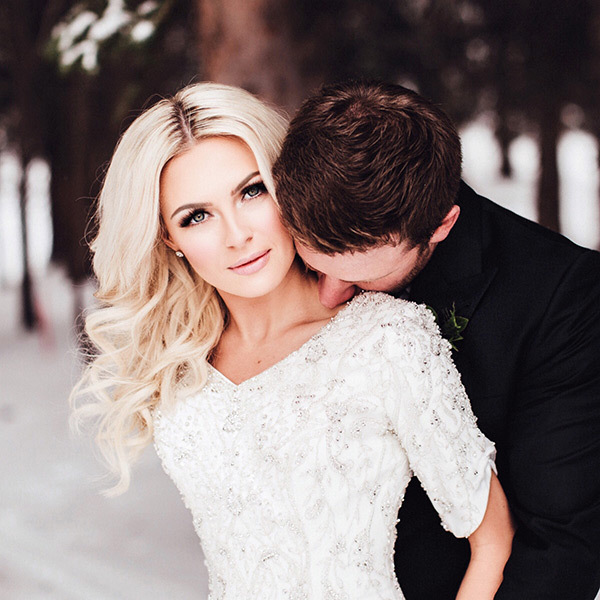 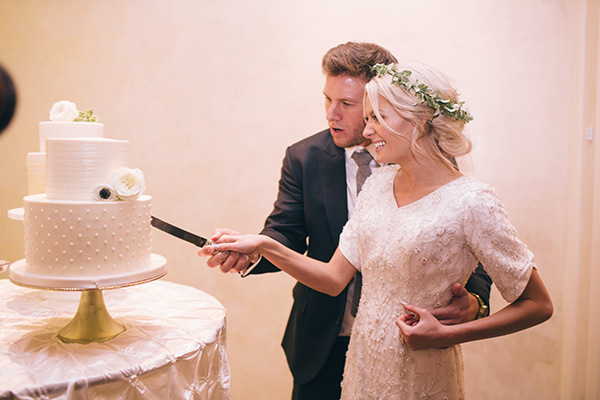 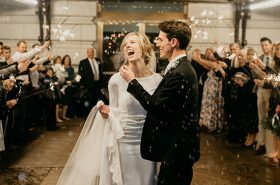 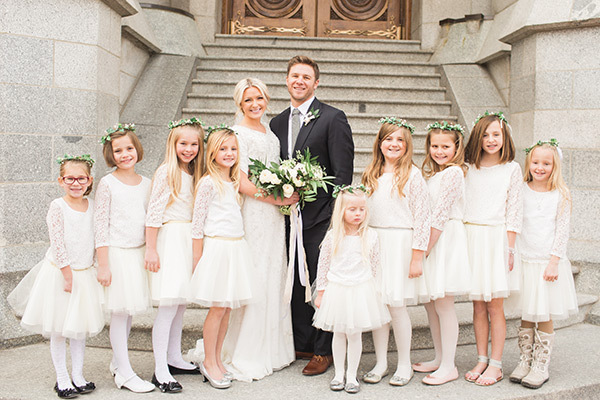 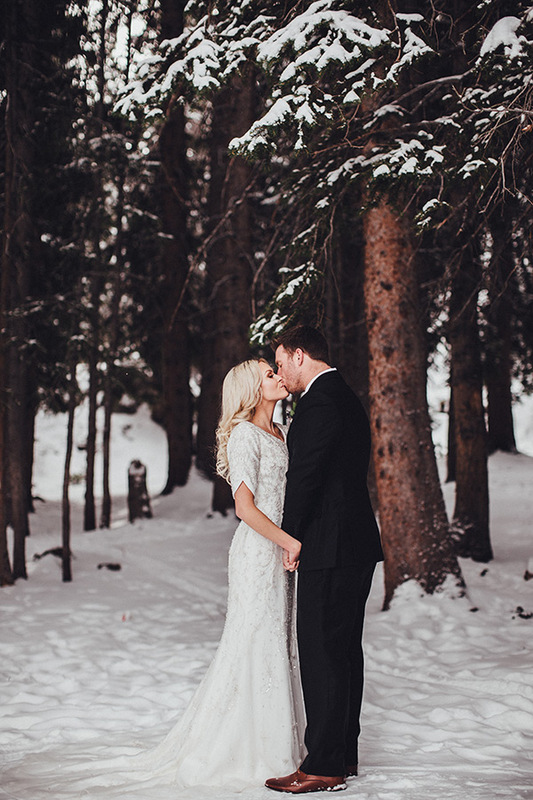 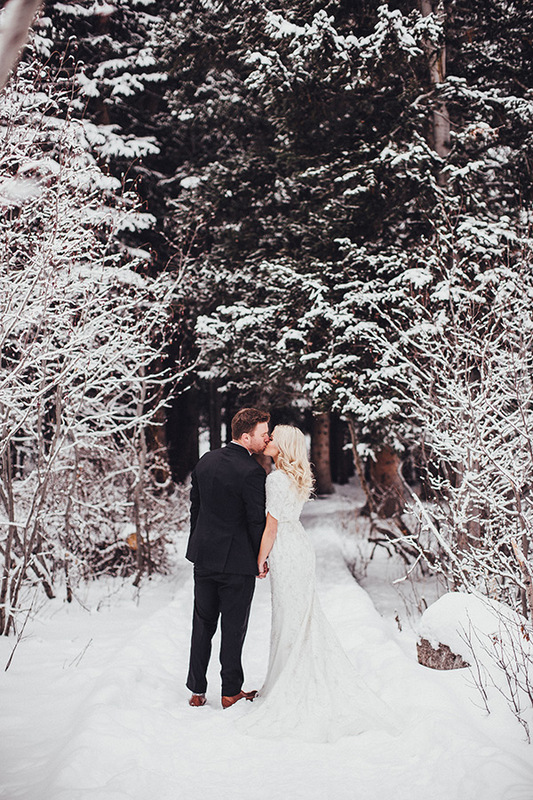 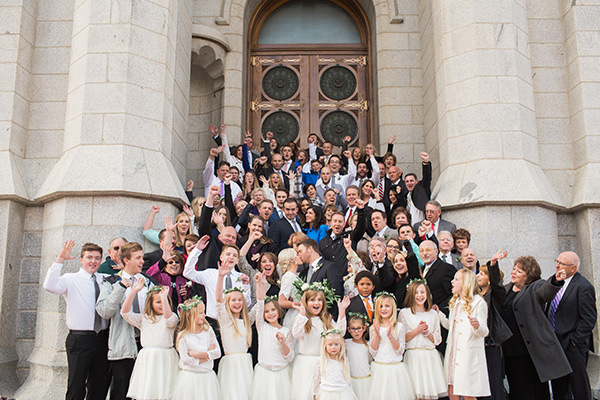 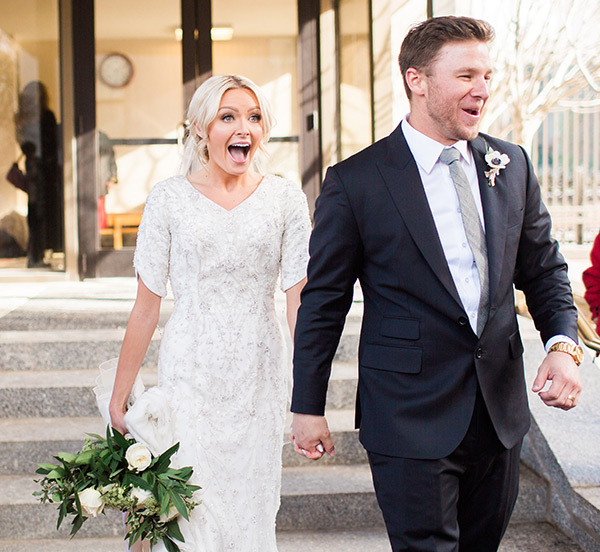 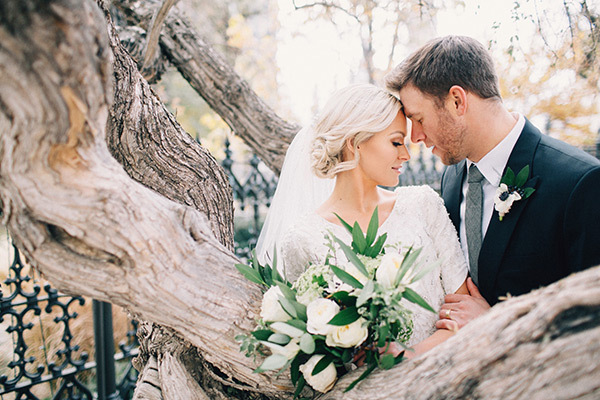 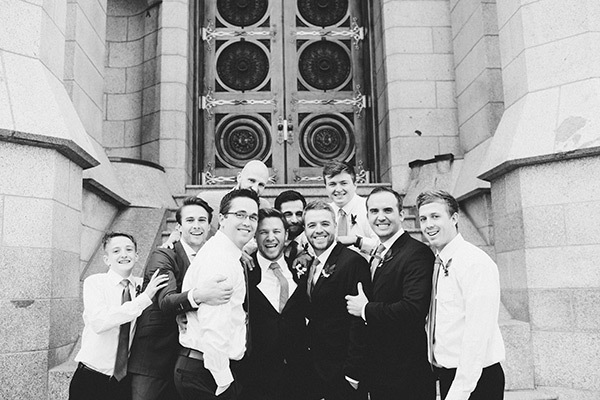 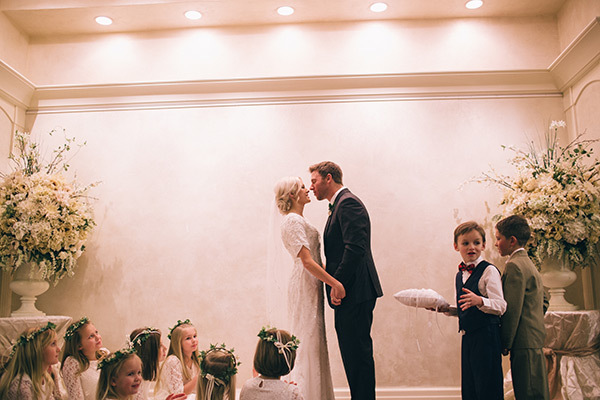 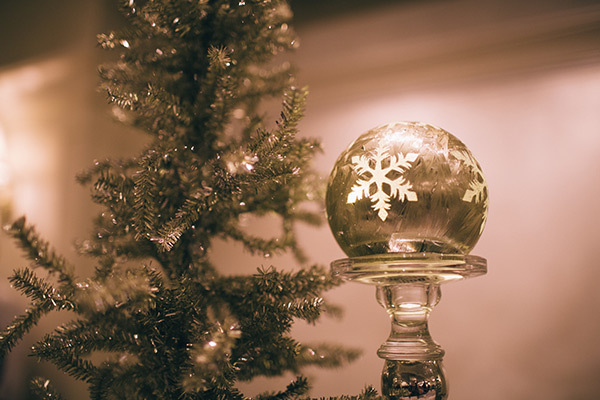 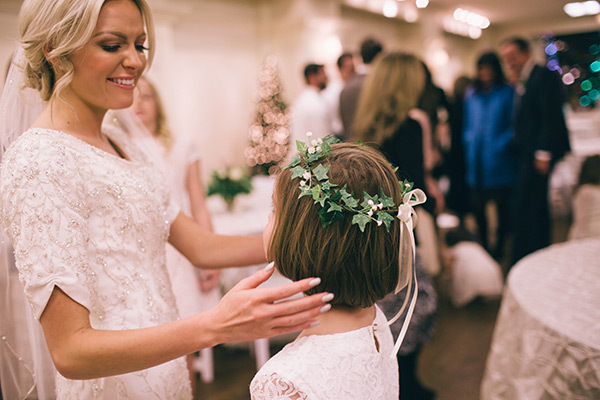 GET THE PICTURE Brit’s wedding is proof that winter is a magical time to get married. 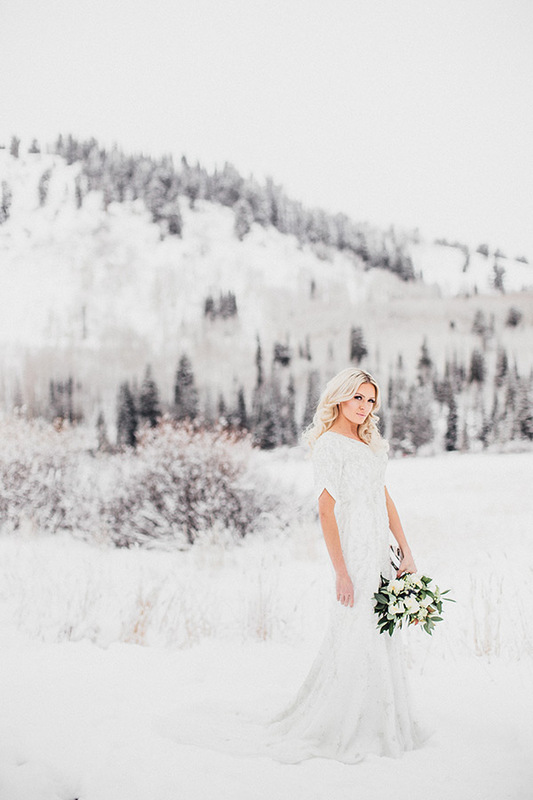 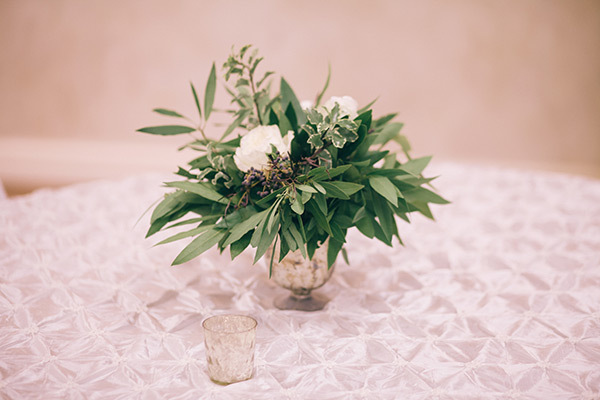 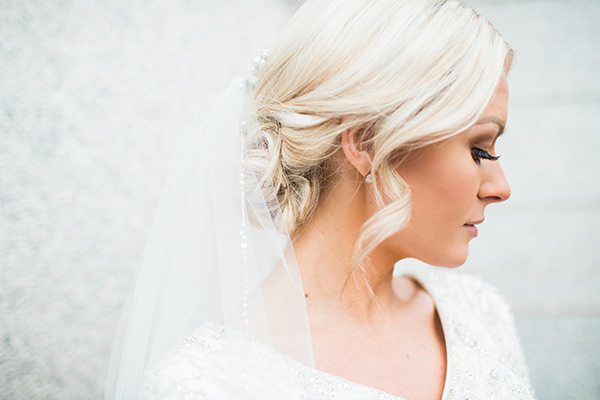 Her bridals boasted gorgeous snow-capped mountains, and for the big day, she kept the winter white theme going with elegant monochromatic florals. 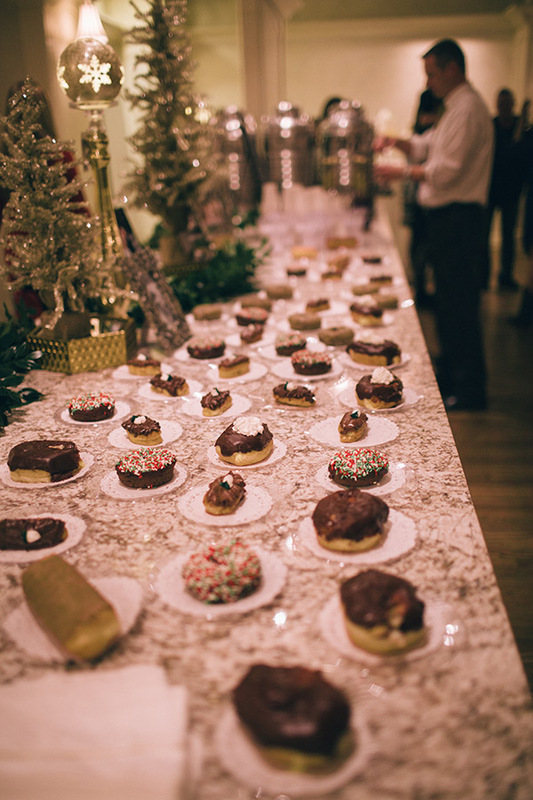 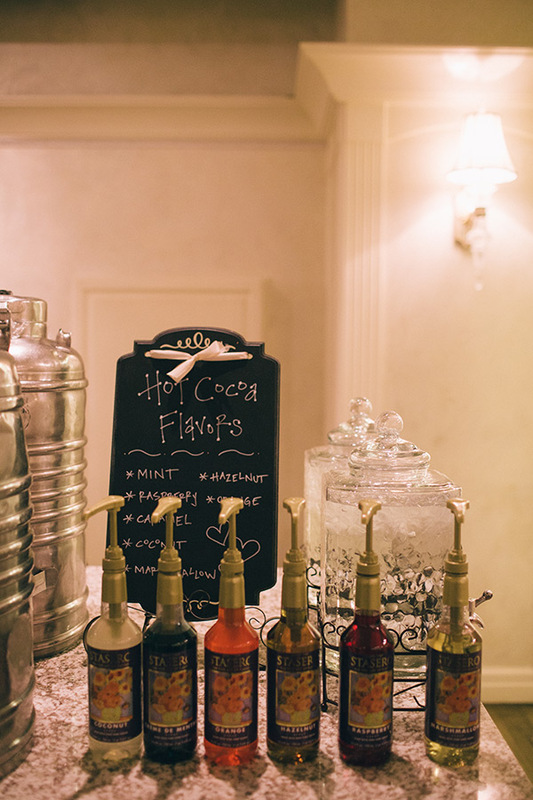 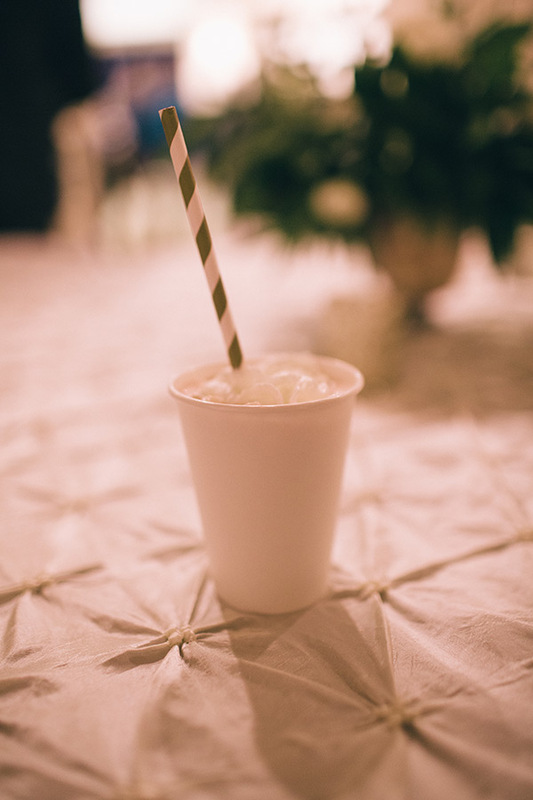 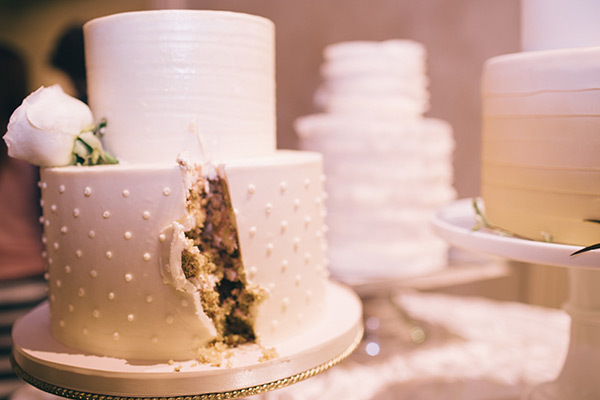 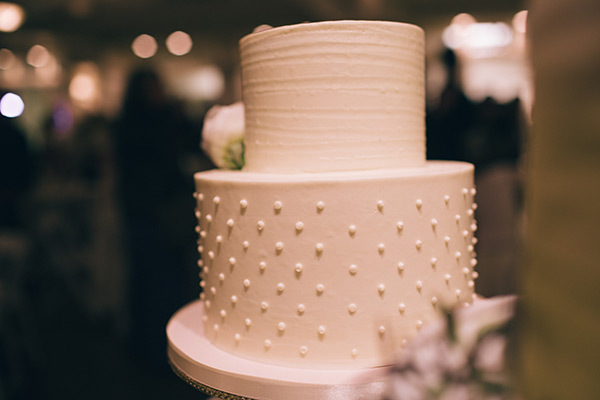 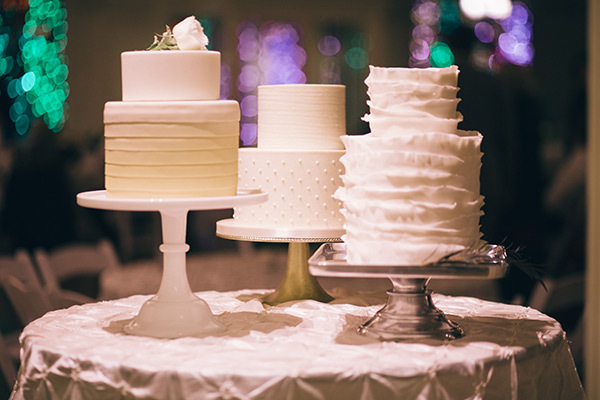 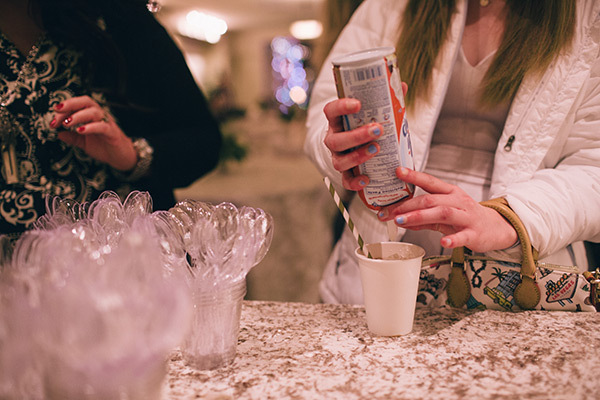 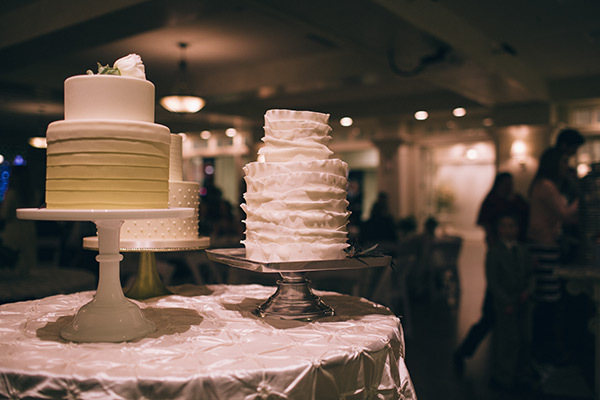 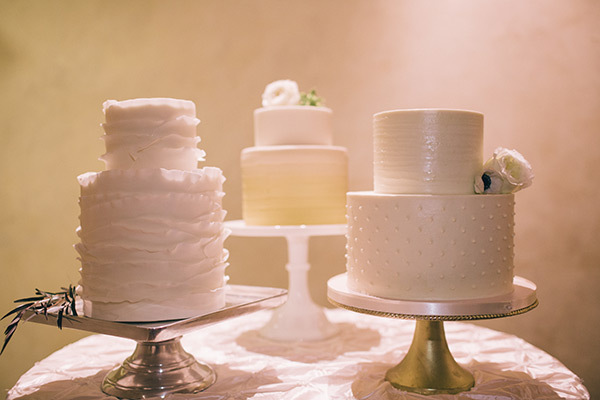 What’s more, she had a hot chocolate bar and a variety of wedding cakes: vanilla, chocolate and a gluten-free carrot (Brit is celiac). 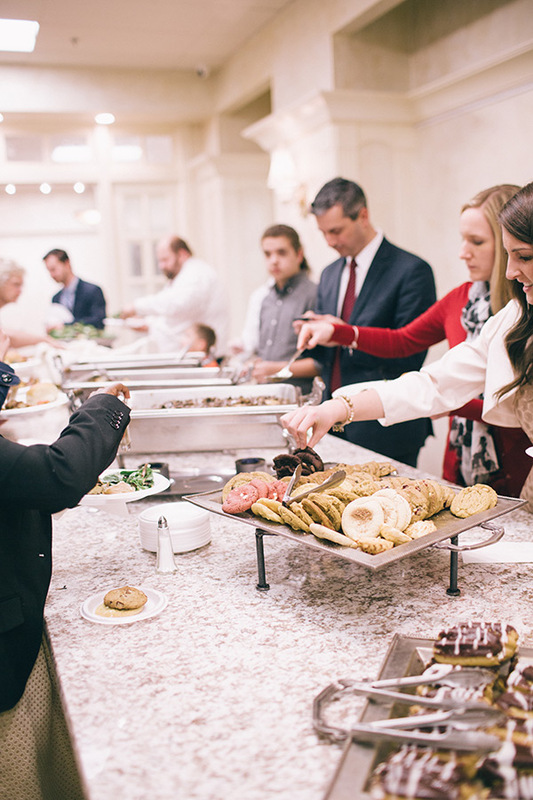 Guests were treated to a delicious dinner of chicken marsala from Copper Kettle. 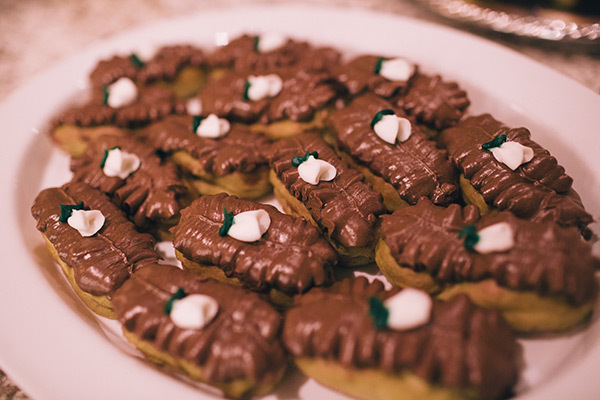 Yum’s the word!